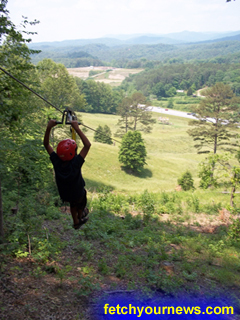 Set in the beautiful Blue Ridge Mountains, Firewire Ziplines offers a family-friendly, one-of-a-kind thrillseeker experience. This brand-new facility, located off Highway 515, just south of the city of Blue Ridge, brings a world-class outdoor adventure experience to an area already known for its hiking, biking, and rafting.Firewire is the creation of Chuck Wolfe, a retired sergeant from the Orange County Sherriff’s department, and his step-son Jayson Hughes, who was formerly in the printing and advertising business. Firewire currently has two parallel zip lines and plans to construct an entire network of lines and platforms later this year for a large-scale canopy tour. The current set-up, as Chuck explained to me, is the steepest and fastest zip line in the U.S.; it reaches a grade of almost 30%, whereas the industry standard is somewhere around 3-6%. Because of the steep grade, and high speeds involved – riders can reach over 40mph – Firewire’s ride features two separate braking systems. I was lucky enough to get a ride, and, I must say, I was impressed. The acceleration is like no other zip line I’ve ridden, and the views are spectacular. The ride gives a visceral sensation of flight, and the speed is enough to satisfy the most seasoned adrenaline junky. The friendly guys at Firewire have put together an experience that goes above and beyond the typical zip line ride. The ride is professionally engineered and constructed, and the company has spared no expense on safety measures. Riders must be 12 years of age or above and must be between 85 and 250 pounds. Group discounts and gift certificates are available; call ahead for details.